If a book or film is seen on the popular series Mad Men, then it must have been influential at that time. 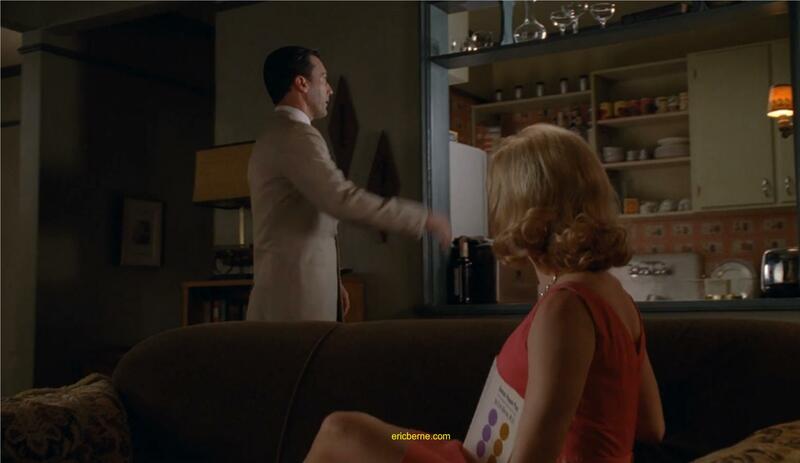 Eric Berne’s Games People Play was featured prominently on an episode of Mad Men. Games was seen in Season 4, Episode 11, titled “Chinese Wall.” The approximate time period for this episode is September 1965. By late September 1965, Games People Play had been on the New York Times non-fiction bestseller list for 9 weeks already. No one, not even Berne himself, had expected his work to enter mainstream consciousness the way it did. In this episode of Mad Men, Games is seen in the hands of psychologist Faye Miller who is romantically involved with Don Draper at that time. Don Draper enters his apartment; psychologist Faye Miller is reading Games People Play and the hardcover version is resting on her lap. Screen shots courtesy of AMC – all rights reserved. In the screenshot above, one can see the cover of Games People Play. The book is difficult to identify unless you know what you are looking for. However, nothing on Mad Men occurs by accident, so the placement of this book is intentional for both the time and the individual holding it. Psychologist Faye Miller is now sitting up to talk to Don Draper with Games People Play leaning against her. Eric Berne’s famous cover is clearly visible and is unmistakable. Screen shots courtesy of AMC – all rights reserved. The scene then quickly moves to a dialogue between Don and Faye and Games is no longer visible. Mad Men is critically acclaimed for its realistic depiction of life in the 1960s and closely follows current events. It is only fitting for Games to be featured in this episode, as its influence on mainstream America starting in 1965 was significant. For a list of other famous books featured on this series, visit the Mad Men Book Club. Note that none of these are related to Eric Berne or Transactional Analysis and this list in not affiliated with ericberne.com. I know who I believe is a sociopath. I saw him as a friend and co-worker, I trusted him. I was close with his family and was around them through good times and well as bad. What I didn’t know, he was conning me using Eric Berne book games people play a ten year con. He push his life on to me while taking mine and forced out of work. I was left homeless, a career destroyed and more. I did not know about such books and about sociopaths. This con destroyed my life. It’s not possible to get back on my feet with what left of life I have. I and not trying to put blame on to you. Just saying that the cons that are written in this book are dangerous.